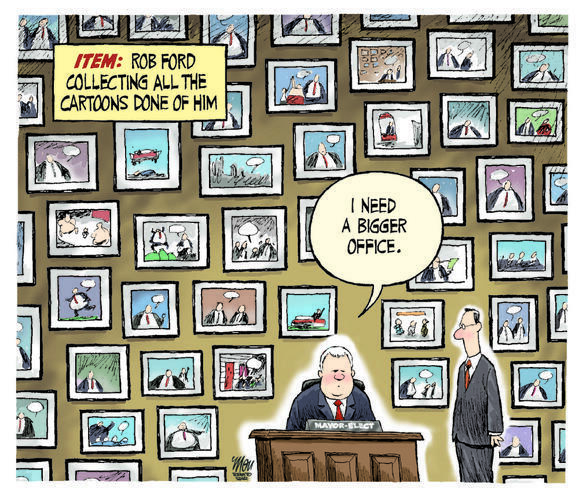 Not since Mulroney’s chin has a Canadian public figure excited editorial cartoonists as much as Toronto’s new mayor-elect Rob Ford. Ford is easily cartoonable, as the abundance of editorial illustrations have already shown: take the Torontoist’s Rob Ford Gaffe-O-Meter, or anything by Brett Lamb. Writing about Ford’s appearance has already gotten the Globe and Mail some unwanted attention.